Future search conferences are highly structured events, usually lasting 2.5 days, at which a cross-section of community members or 'stakeholders' create a shared vision for the future. They are more suited for dealing with general issues than specific sites. People representing the widest possible range of interests, or 'stakeholder' groups, are brought together in one room, usually for 2.5 days. The ideal number is considered to be 64 since this breaks down in to 8 groups of 8. For larger groups, conferences can be run in parallel. The agenda is: 'The Future of ................ 5 to 20 years on'. A structured 5-step procedure is adopted (as summarised in the sample timetable, right). This is designed to encourage people to think globally, focus on the future, identify common ground and make public commitments to action. People carry out tasks individually, in small self-managed workshops and as a whole group. The results are recorded openly on flipcharts. 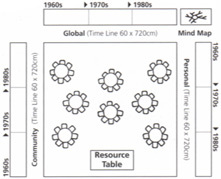 Eight tables with eight chairs per table; a resource table (for marker pens, notepads, etc); large sheets of paper on the walls for drawing three time-lines and a mind map. At least one experienced facilitator is essential plus a committed group to plan the event in advance and follow it up afterwards. The conference must be part of a wider and longer process. Discourage non-participating observers. All those present should take an active part. Main costs: Venue, meals and facilitation fees. Can range from US$4,000 to $60,000. $8,000 ­ $16,000 is common. Sample to use as a basis for designing your own. Review the past. Participants explore key events in the histories of themselves, their community and the world, and present them on three time-lines. Explore the present. Trends affecting the community are explored and illustrated by creating a mind map. Groups share what they are proud of and sorry about. 09.00-12.00Continue with exploring the present. 12.00-18.00Create ideal futures. Visions developed in small groups and acted out to everyone. Barriers to the visions identified. Identify common ground. Shared vision identified, first by small groups and then by everyone. Projects to achieve itidentified. 09.00-13.00Make action plans. Projects planned by self-selected action groups. Public commitments to action. 64 (8 tables of 8). "I've not heard so many great ideas expressed in such a variety of clever and articulate ways... I don't know what benchmarks you use but by my lights this is the most useful, tangible, actionable output that I've ever seen." Dennis Alter, Chairman & CEO, Advanta Corporation. Future Search Website intro, 1999. "Staging a future search means changing our assumptions about large, diverse groups. In these meetings we learn that most people can bridge lines of culture, class, gender, ethnicity, power, status and hierarchy if they will work as peers on tasks of mutual concern." Marvin Weisbord and Sandra Janoff, Future Search Website intro, 1999. Participants create personal, community and global histories by writing key events on large strips of paper on the walls. This helps to make history visible, discover patterns and understand what the past means.